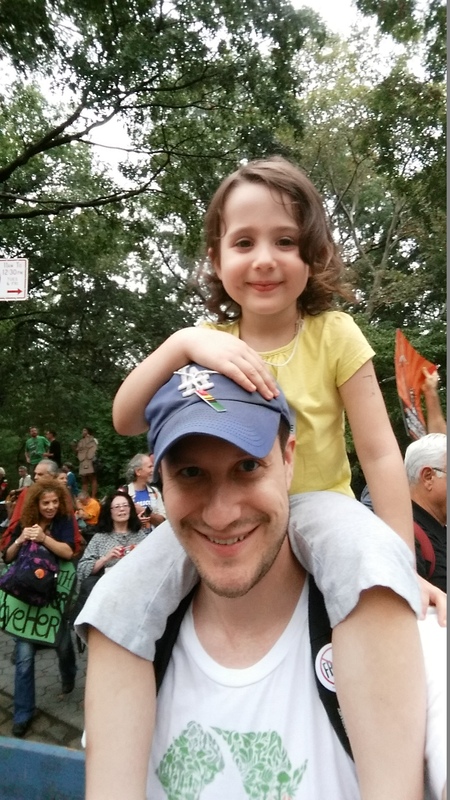 Adam Miller and his daughter, Violet, at the People’s Climate March in New York City, September 21, 2014. I traveled from Lancaster, Pennsylvania, to New York City by bus for the march with a group called the Citizen’s Climate Lobby. I am not affiliated with the group but one of the organizers of Lancaster’s chapter (Jerry Lee Miller) attends Community Mennonite Church of Lancaster where I am a member. I am a mental health therapist by trade and not accustomed to activism beyond a very occasional email to a senator or a semi-annual donation to Amnesty International. However, as I contemplated the gravity of the situation before us I decided that I needed to do something beyond changing my light bulbs and feeling hopeless once a month upon reading the latest news release about how the situation is now worse than anyone realized. I decided to take my 3-year-old daughter along because I had the sense that this could be a formative experience for her and a chance to instill the values of justice, equality, and concern for the common good. It was inspiring and everything that I saw was family friendly and appropriate for my daughter. Her favorite part was the bus ride. I was shocked by the number of young families at the march and the enormity of the crowds that came out – truly staggering.